Benfica kept alive their dream of a first European trophy in 52 years after a goalless draw with Juventus in Turin on Thursday helped the newly-crowned Portuguese champions win their Europa League semi-final 2-1 on aggregate. Jorge Jesus's side will return to Turin on May 14 to take on Sevilla in the final after restricting the Serie A leaders to a handful of chances, despite having to play for 23 minutes of the second leg clash with 10 men after Enzo Perez was sent off. "We managed the advantage we had from the first leg really well and we deserve to be in the final because we were better than Juventus," said Benfica coach Jesus. The Portuguese side will be hoping to win their first continental title since 1962's European Cup triumph, since when they have lost seven finals, including last season's Europa League showpiece to Chelsea. Juventus failed to take advantage of their territorial superiority in the first half or the extra man after the sending-off and their exit is a blow for Italy, whose teams have struggled on the continent in recent years. Juventus coach Antonio Conte was annoyed with the away side's defensive mindset and English referee Mark Clattenburg, who he felt should have given a penalty against Luisao for appearing to block Fernando Llorente's 65th-minute header with his hand. "They're going through to the final, but I don't think they deserved it," said an irritated Conte. "The only thing we missed was a goal. Over the course of the two legs we conceded two shots on target. We tried but tonight but we didn't have the run of the ball." Benfica came roaring out of the blocks looking for the goal that would have left their hosts a mountain to climb, with Juventus defender Stephan Lichtsteiner blocking Rodrigo's stinging close-range strike in the opening minute. Juve slowly gained control as the first half wore on and Vidal was unlucky not to give his side the lead seconds before the break when he met Kwadwo Asamoah's fizzing cross with a header that was cleared off the line by Luisao. The away side gave Juve a scare two minutes after the break when Rodrigo ballooned the ball over the bar from close range with the goal at his mercy. Perez was sent off after receiving a second booking for a silly foul on Arturo Vidal and his dismissal encouraged Juve to push forward in search of the goal that would have sent them into the final. The home fans were celebrating with nine minutes remaining when Osvaldo tapped home Paul Pogba's headed knockdown, but their joy was short-lived, with officials correctly ruling Frenchman Pogba offside. Unused Juventus substitute Mirko Vucinic and Benfica's Lazar Markovic, who had been taken off with minutes remaining, both received red cards for an off-pitch altercation as the bad-tempered match wound to a close. Benfica were reduced to nine men after Ezequiel Garay was stretchered off during eight dramatic minutes of stoppage time and the Portuguese side's keeper Jan Oblak made a fine save to keep out Martin Caceres's header. "Tonight we saw that in football the best team doesn't always win," Juve defender Leonardo Bonucci said. 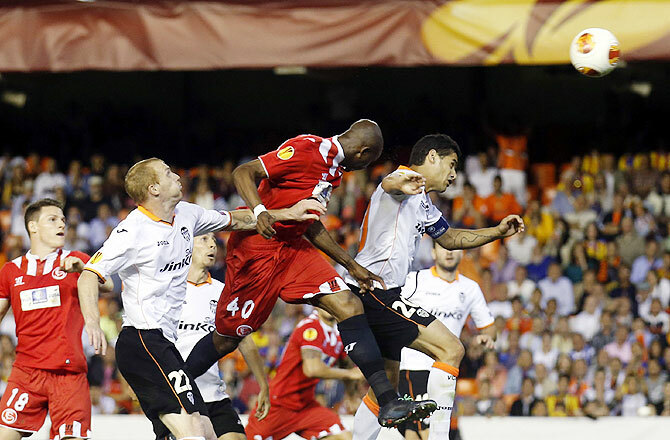 Sevilla snatched a last-gasp place in the Europa League final when a 94th-minute Stephane Mbia header put them through on away goals after their semi-final against Valencia ended 3-3 on aggregate on Thursday. Despite going down 3-1 in their second leg at Valencia's Mestalla stadium, Mbia's dramatic late strike set up a final showdown with Benfica. It was a triumph for Sevilla coach Unai Emery, who never completely won over the Valencia fans when he was in charge there from 2008 to 2012, and he celebrated Mbia's goal wildly on the side of the pitch. "This is a unique experience," Emery said in an interview with Spanish television. "We don't care who we are playing in the final, we just have to enjoy this," added the 42-year-old former Real Sociedad midfielder. "Now we have to beat a great team (Benfica) because they have beaten Juve, who are also a great club." Valencia forward Pablo Piatti struggled for words in a TV interview immediately after the whistle and said he and his teammates were "feeling the pain" and "in a bad way". "We tried, we gave it everything and they scored against us in the last minute," added the Argentine. "We are happy with the work we put in but it was pointless in the end." The home side forced themselves back into the tie when Feghouli received the ball inside the area and cut inside his marker and his left-foot strike took a slight deflection off a defender on its way into the net. Valencia were level on aggregate in the 26th minute when Jonas made the most of slack marking to send a powerful header towards goal from a Juan Bernat centre. Both sides showed attacking intent in the early stages of the second half before defender Mathieu was quickest to react when the ball ran loose at a corner and the Frenchman left Beto no chance with a powerful shot. Valencia were moments away from going through when Mbia struck to keep alive Sevilla's chances of repeating their successes in Europe's second-tier club competition from 2006 and 2007, when it was known as the UEFA Cup.